Freshman Lexi Wenger paced Northmor in their come-from-behind playoff win at Mount Gilead Wednesday, scoring 23 points on the night. Mount Gilead’s Madison Fitzpatrick paced her team’s Wednesday effort with a 19-point showing. 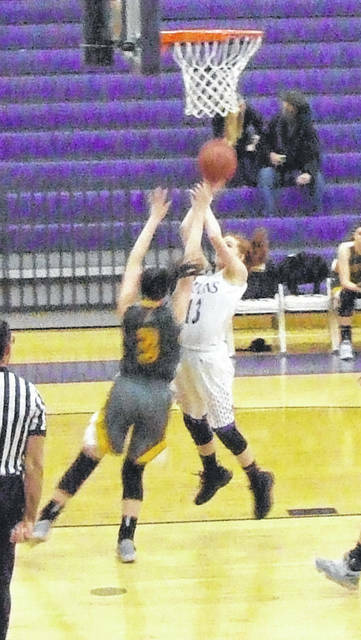 For three quarters, it looked like Mount Gilead would cruise past Northmor on Wednesday and advance in the Division III girls’ basketball playoffs, as they scored the first eight points of the game and gradually increased their lead to a 39-21 margin by the end of the third period. The fourth quarter was a completely different story. The visiting Golden Knights went on a 22-0 run over the first 6:05 of the period and then controlled the boards late to hold on for a stunning 48-44 win. Northmor coach Freddie Beachy gave a lot of credit to his team’s lone senior, Addie Farley, for keeping his squad mentally in the game, regardless of how large their deficit was. It was Northmor’s two freshmen starters who sparked the team’s fourth quarter run. Reagan Swihart opened the period with a basket. After MG missed a pair of free throws, Lexi Wenger hit from the field to make it 39-25. After a free throw from Macy Miracle, Wenger then tallied a three. Farley followed with another three-pointer and Swihart then tallied her own shot from long range to cut the team’s deficit from 18 points to four in less than three minutes. Northmor remained hot from the floor, though, getting a basket from Wenger and two from Miracle to surge past MG 41-39. A free throw by Miracle made it a three-point game, but MG’s Madison Fitzpatrick buried two free throws to bring her team within one with 1:38 to go. Northmor’s Wenger drew a foul with 45 seconds left to attempt a one-and-one. She missed her first shot, but the team got the ball to start a stretch of great offensive rebounding by the Golden Knights. While four free throws by Farley and two from Wenger only netted three points, the team was able to retain possession after each miss due to crashing the boards. Then, after Julianna Ditullio hit one-of-two, Northmor was able to get the ball back via jump ball after MG finally snared a rebound. Ditullio would hit one-of-two again to put the Golden Knights up 46-41 with 8.5 seconds left. 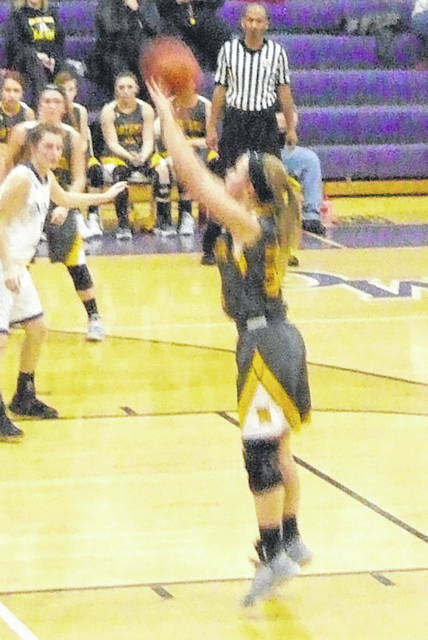 Fitzpatrick was able to drain a three-pointer to keep the Indians alive, but after drawing a late foul, Wenger hit both of her foul shots to clench the dramatic victory for Northmor. Over those three quarters, MG got off to a fast start and gradually widened their advantage over Northmor. Holly Gompf scored six quick points to spark the team to an 8-0 lead. After Wenger hit a pair of free throws to get the Golden Knights on the board, the Indians got five straight from Fitzpatrick and two from Dakota Shipman to lead 15-2. Northmor got a three from Wenger and a basket from Swihart to close within a 15-7 margin by the end of the period, but the team only scored four points in the entire second quarter to trail 23-11 at the intermission. Leading 27-15 early in the third, the Indians got five quick points from Fitzpatrick to help them go up 33-16. Wenger hit a basket and free throw, but MG responded with buckets from Fitzpatrick and Isabela Schroeter and two Gompf foul shots to increase their advantage to a 20-point margin. While Northmor got a bucket from Miracle to end the period, they still trailed by 18 going into the final eight minutes. While disappointed with the loss, Stover feels his team has a lot to be proud of, as they’ve continually improved during his time with the program. Fitzpatrick led the Indians with 19 points, while Gompf tallied 15. Northmor got a 23-point performance from Wenger, while Swihart scored nine and Miracle added eight. Beachy, whose team moves on to play at Utica in Saturday’s sectional finals, was just happy to celebrate a hard-fought win after the game.